I left my house in Central Texas in 1998 and didn’t return until January, 2014. Lucky for me, I had a man who rented my home and stayed until I returned. From 1995 to 1998 I was stationed here with the Army. My two children were still in the very young, run-around-and-chase everything stage back then. We would often go for walks around our area, which really hadn’t been too developed. There was our little “subdivision,” with nice .80 acre lots. On the other side of the division were smaller lots, mostly occupied by mobile or modular homes. Down to the south of our subdivision is a lake. The trails down to the lake usually cross someone’s property and they don’t appreciate folks taking those shortcuts. Since the trails are not maintained at all and rather steep, I would advise anyone from going down to the lake that way anyhow. In November, 2013, I had an opportunity to go hunting near my parents’ home in Missouri. My brother hunts there every year and, as much as I had always wanted to, never had a chance to participate – until that November! My hunt was successful; I took a small button buck. Whitetails are the smallest North American deer species. Still, he dressed out rather nicely and likely because he wasn’t very old, the meat was very tasty. My brother, on the other hand, didn’t manage to take a deer that whole week we spent in the Missouri woods. As we came around to a large property, about three doors down from mine, there are 25 deer of various sizes lounging in grass! The property owner keeps the grass there cut low, there are no real bushes or anything, they are just laying out in the open like they own the place. I have since discovered that the man who owns that property feeds them daily. He calls to them with a loud whoop and whistle, and they come running, whether he’s actually putting out corn for them or not. We pull into my own driveway and find five loitering in my backyard. We NEVER saw this many deer in this area when my children were younger. I think they would have loved it! As it was, we kept chickens for eggs, so that was fun, but there really isn’t much “hunting” in grabbing eggs from beneath broody chickens. After inspecting the property, we made our way back to Oklahoma City. That December we left our previous home and arrived here on January 1, 2014. After moving in, I asked a few of the neighbors who had stayed here during my absence about the increased deer population. I was told that several factors contributed to the situation. First, there had been a fire in the brushy ravines leading down to the lake. This fire caused the deer to move uphill, away from the fire. Second, increased development to the north and east of my little subdivision took away more of the deer habitat and none of those lots came close to the size of mine. Third, once they came into the neighborhood, certain folks began routinely feeding them. 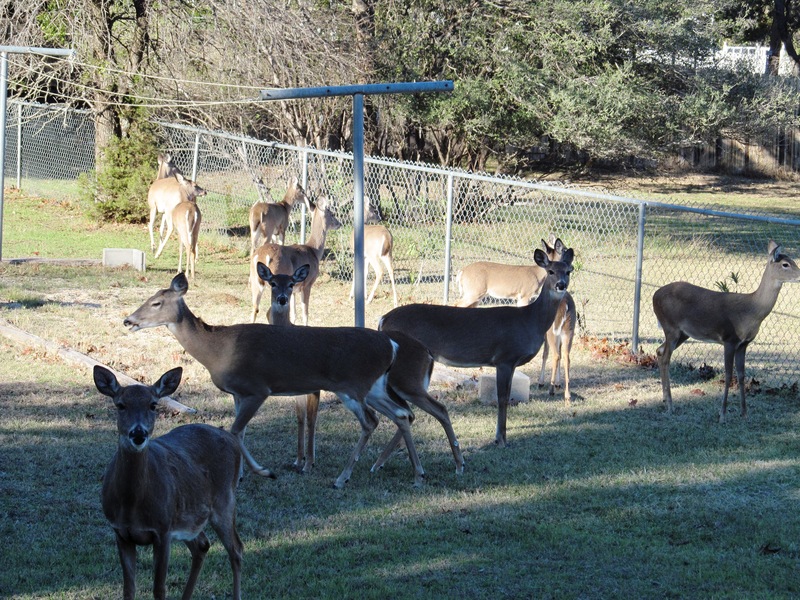 So, acts of nature and man combined to create a rural or suburban deer population. Both of my immediate neighbors routinely feed them corn. The one neighbor, in fact, sports long white hair and a long white beard and calls them by name. This makes me kind of suspicious, especially as I don’t see him in the area around Christmas. I already mentioned that land baron who calls to them. I was complaining to my neighbor on the other side of me how annoying it was to not be able to plant a garden, deer WILL eat any vegetable or flower you try to grow, and then HE starts feeding the buggers. On a normal day, a herd, there are several of them now, will leisurely pass through my yard between 8 and 9:30 AM, then again around 5 to 6 PM. Depending on the heat of the day or how much food they’ve mooched, they may simply lay down and sleep all day in my yard. I have had up to 25 deer in my yard! Sixteen to seventeen seems about the average number, though. Both springs, I have witnessed the birth of at least one pair of fawns. I suppose with so much exposure to them, next time I hunt I can predict their behavior a bit better. The negative consequences, however, are considerable. One hit my wife’s car as she was driving and that cost us a couple of thousand dollars. There have been several other similar accidents and when I say the “deer hit the cars,” they do. Normally the driver tries to avoid, but the deer run at the cars! 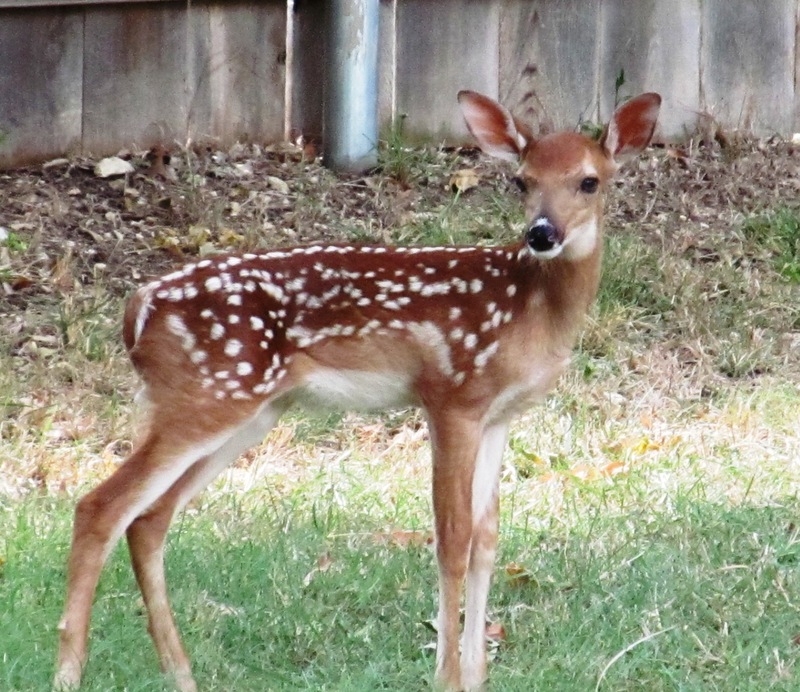 On an evening walk, we witnessed a doe teasing a barking dog on a tether in someone’s backyard. I can understand a doe protecting fawns, but there were no fawns around. The doe would run up to the fence, the dog would bark like crazy, then the doe would run back and forth along the outside of the fence making the dog insane! My wife and I walked in that general direction because I had never seen such a thing. The doe quit teasing the dog, but then starting making threatening moves toward us! She put her head down, stamped her hoof, run at us a couple of steps, then back up. We always park our cars in our garage. The deer have gotten used to the sound of the garage door opener. Two days ago, I walked out of my front door, apparently my neighbor was providing them with a wonderful corn feast, and I guess I spooked them because I did not come out of my house the way they expected. There was a literal STAMPEDE! When they spook, they first scatter everywhere, then all end up going in the same direction. 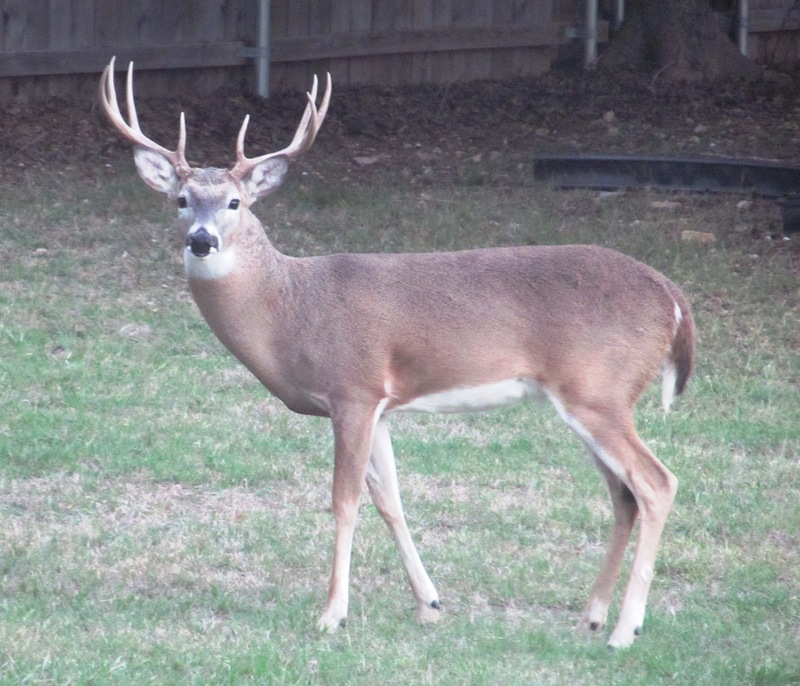 What would happen if a child had been in the yard across from me when they went berserk? If they are not afraid to charge moving cars, do you think they’ll fear a small person? City and Texas law is strict about how far away from houses you have to be to discharge a firearm, so there is no possibility to hunt them to “control the population.” The city, county and state insist there is nothing they can (will) do to address the situation. Sometimes I complain about them. They are pretty, but it is also very sad when you see one that has run into a car and broken a leg, or been scarred from such an accident. I have a chain link fence. Reportedly, one tried to jump my fence during my absence and disemboweled itself. Animal control came for the carcass. In conclusion, yes, I admit they are pretty animals. The bucks when they sport their horns in the fall and winter can be quite remarkable. I even recognize some of them by marks, scars or antlers. I won’t name them, though. 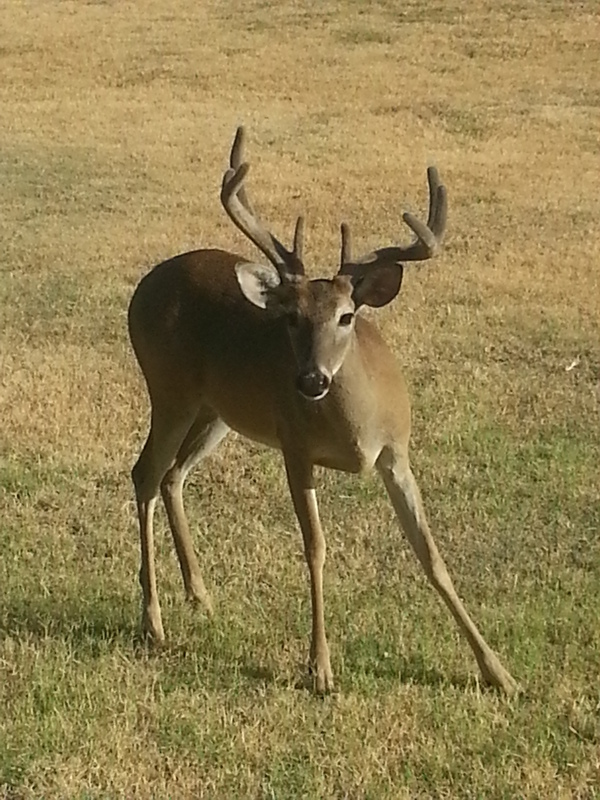 They ARE wild animals, though most of the subdivision considers them pets. Some friends suggest that I use a crossbow or bow to hunt some to reduce the numbers. If any of my neighbors saw me intentionally do anything to these critters, I think they would forget their kindness to animals and lynch me in “good ol’ fashion Texas style,” though I don’t think any of them are actual Texans. By Richard in Literature on October 16, 2015 .